RUSH: And we’re gonna start on the phones with Laurie in ChampionsGate, Florida. Great to have you on the program. How are you doing? CALLER: All of this craziness is so different from what we suffered for years with the media protecting, fawning over the Clintons and the Obamas, covering up, spinning, misdirecting scandals. How does it change? And the toothpaste is out of the tube with all this stuff. The Clinton years infuriated us, but we laughed at it because it was so ridiculous. But we’re not laughing anymore, and I am so optimistic because President Trump is a steamroller and we’re fighting with him because you have shown us we can take these people on. And I have become a more effective promoter of my ideas and opinions, and the big thing is, I’m not shy about it anymore. RUSH: Way to be! Way to be! I’m so happy to hear that. You know we had a caller yesterday — not to disparage the caller, but she said she wished Trump would stop tweeting because she’s tired of having to defend him. CALLER: No way. No way. And this is a huge departure for me. It makes me so much more optimistic, and I am on fire, Rush. And if you have time, I’d like to make one small suggestion for your listeners. RUSH: Well, fine. Go ahead. CALLER: I’m a Rush 24/7 member, and I have my podcast downloaded to my classic iPod, the one with the wheel. CALLER: And I have the best fun spinning that thing back like a roulette wheel and listening to really, really old episodes because not only are they relevant, it’s so much fun to look back and see if the premises of your ideas are right, you’re right, it’s very simple. And that has made me a more effective communicator. RUSH: — on the program for years, and here you are just randomly spinning your iPod wheel, randomly going back in time, finding a random segment of the program; and you’re sitting there marveling at how consistent I am from year to year to year and how right I am from year to year to year and how that is inspiring you. CALLER: It’s so inspiring because it just makes me more confident that if the premise is correct, you can make a more effective argument. And then I’m a better study because I re-listen and I relearn, and I’ve now lived the consequences. So I can more effectively have an argument with somebody. RUSH: I can’t improve on that, that is so right. You’ve touched every base. Confidence, premise, confidence being the big one. And the confidence comes from the acquisition of knowledge combined with what your instinctive feelings, thoughts are. Once you can combine your instincts with knowledge and evidence and proof, that inspires confidence, and there’s no stopping you. 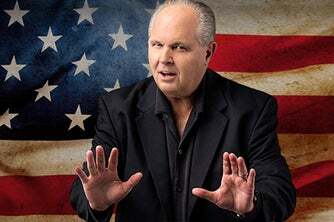 RUSH: It’s true with anybody. RUSH: Before I let you go, where’s ChampionsGate, Florida? CALLER: It’s I guess the infamous I-4 corridor, Osceola, Polk County? RUSH: What’s the largest big city you’re next to? I don’t drive so I don’t know where the I-4 corridor is. CALLER: Between Lakeland and Orlando. RUSH: I know right where it is when you give me those data points. The I-4 Corridor, I’d have to get a map out and find I-4. I only know I-95 and the turnpike. I-4 is on the other side of the state. I’m never over there except when I fly over it, so I don’t know. I know I-75 goes somewhere in there. But, anyway, have you ever heard of ChampionsGate, Florida, before today, before she called? Nobody has. So I’m doing a service here. You know, this is empathy with the audience. The audience, the minute they heard me say ” ChampionsGate, Florida,” said, “What?” So I felt duty-bound to find out where it is. And, Laurie, look, I’m not blowing smoke here. Everything you’ve said today is so right on. I’m not talking about the complimentary things you’ve said. I’m talking about the way you have arrived at this point in your life where you’re on fire based on your confidence, the things that have given you the confidence and never wavering on the premise or premises of what you believe. And, believe me, being able to summarily reject the media and not be affected by it, that is one of the major achievements everybody on our side should strive for, to be unaffected by the lies, unaffected by the bias, the drivel, or wherever it is. Because once you get past that, they can’t harm you, they can’t ruin your mood. They can make you mad, but as she’s pointing out, all it does is fire you up. And I think she represents a lot of people, fired up, fed up, supportive. I’m gonna list Trump’s achievements again that have taken place this year. And it will put at even more stark contrast the reasons the Never Trumpers on our side don’t like him. It’s amazing. I finally zeroed in on it. I’ve always thought it was a class thing. And it is to a certain extent. But it’s more than that. I’ll just tell you what it is. I’m gonna expand on this. The problem for the Never Trumpers on our side is Trump pretty much is everything they believe, but they hate Trump so much they’re mad that Trump believes what they believe. They’re mad because Trump is such a pig, and they’re mad, so they’re willing to abandon what they believe because they think it’s necessary to abandon Trump because he’s such a pig.